Never in a million years did I expect my life to turn out as it has. Five years ago I just wanted to write a book and not be told what I should write about. Today, I have a lot of “titles” behind my name related to what I have accomplished. I’m a blogger, I have written articles, I have had articles written about me. I’m being contacted to speak at events, attend events, cover events as a member of the media. In a few days I will share a magazine cover with two other amazing professional women. I was recently contacted by one of the leading social media platforms because they want to feature my professional profile. People want to take pictures of me and take pictures with me. Every time I look up someone is stealing my company logo to use for some purpose completely unrelated to Super Woman Productions and Publishing and I must have it removed for trademark infringement. I’ve met so many celebrities, I’m already starting to lose count, and I have yet to meet Oprah. My radio show, The FabLife Radio Show is completing its first year of broadcasting online in a few short days. We’re celebrating with a Google On Air Hangout. 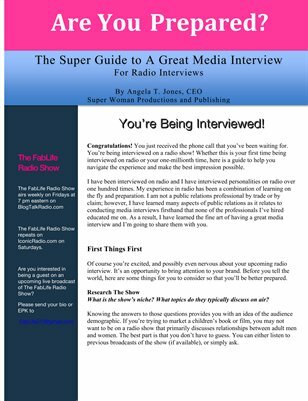 I’ve been honored to have over fifty celebrity and subject matter experts give me a few moments of their time for live interviews. I get so many invitations to events that I have to decline the majority of them because my schedule is constantly full and I lose sleep as a result. This isn’t what I imagined at all. This wasn’t my goal five years ago, ten years ago or when I was a child. I woke up one day and realized that the difficulties I have had adjusting to my changed environment are because of my desire to have something that isn’t for me. I wanted to be married with children. I felt that being in a relationship was very necessary for me to have complete happiness and fulfillment in my life. Now I answer to the name Super Woman like it’s my government name. And I’ve learned to let go of what I thought I was supposed to be, and supposed to have, and embrace what and who I am. Along the way, I have back slid. I’m person enough to admit it. But the more I accomplish, the more I’m realizing that what is mine, is not for me or anyone else to question, agree with or even understand. This isn’t the life I planned for myself. Sometimes in life we’re unhappy because we want a fantasy. Everyone’s fantasy is different. Some people may want to be professional athletes but incapable of throwing or catching a ball. Some people may want to be a professional model so they post selfies of themselves online all day, just hoping to get discovered. Just like everyone can’t be a doctor, everyone can’t be a celebrity. I wanted to be married. It was the one thorn in my side. I was feeling pressured to be in a relationship because I’m approaching 40 and everyone I know and love are married and happy. So after one last unsuccessful attempt at a commitment, I realized that my fantasy would not bring me happiness or make me complete. If anything it seemed to cause drama. Wake up call: Marriage is not included in the life that I’m meant to have. I’m much too busy for a committed relationship. Being in entertainment has its own level of complications that will only distract me from my short and long-term goals. Add marriage into the equation and it could be very stressful. It takes a special kind of person to deal with what I do and how busy I am. That’s not going to slow down anytime soon. Each year gets busier and busier for me. I’ve even had married people tell me that I don’t need a husband, I just need to date men with money and make sure they understand their role isn’t to try to change my relationship status; but to keep me company when I need them to. Don’t get me wrong. Just because marriage isn’t for me, that doesn’t mean that I don’t believe in the value of it. I love to see people in love and loving one another. It’s a beautiful thing. But in my life, I’m married to me, and the Super Woman Brand. And what God has joined together, let no man put asunder. If there is something in your life you feel that you need to have to be happy and whole, I encourage you to reexamine it today. Determine is it a fantasy or a goal. Goals can be accomplished by working towards them. Fantasies can’t. Goals lead to other goals. Fantasies don’t. Are you pretentious? Are you living a false existence because you have a fantasy of a life you want based on material possessions or what you see celebrities having or doing? Keep in mind that to whom much is given, much is also required. You will always have to trade or lose something to make a fantasy come to fruition. But if you find out what your reality is, embrace it and learn to maneuver in it, you can be extremely happy no matter what happens. All of that wishing for something else is keeping you from having the success you could have. Learn to love your reality, instead of wishing for your fantasy. All the time you put into the latter wastes time you could be spending enjoying your life in all of its glory. This isn’t the life I thought I’d have. But I’m glad it’s my life. It’s my reality.